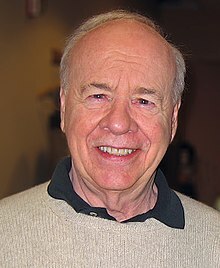 Thomas Daniel "Tim" Conway (born December 15, 1933) is an American stand-up comedian, actor, director, writer, singer, voice artist, and comedian. He has worked in sitcoms, comedy sketches, and in movies. Conway is best known for McHale's Navy as Ensign Charles Parker. To younger viewers, Conway is known for Barnacle Boy in SpongeBob SquarePants. Conway was born Thomas Daniel Conway in Willoughby, Ohio on December 15, 1933. His mother was Romanian. He was raised in Chagrin Falls, Ohio. Conway went to Bowling Green State University. Conway was married twice: His first marriage was to Mary Anne Dalton in 1961. Conway and Dalton had six children. One of them is radio host Tim Conway, Jr.. Conway and Dalton divorced in 1978. Conway's second marriage was in 1984 to Charlene Fusco. Conway and Ernest Borgnine were good friends until Borgnine's death in 2012. ↑ Thomas Attila Lewis (2011-04-08). "Interview Tim Conway – To Appear at the Wilbur on Sunday". bostonist.com. Retrieved 2011-05-21. Wikimedia Commons has media related to Tim Conway. This page was last changed on 6 April 2019, at 22:39.